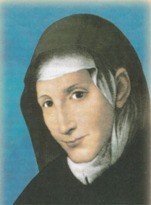 First apparition of the Virgin Mary to Bernadette. There have been 14 lachrymations, one of which in the presence and in the house of the bishop Mons. Girolamo Grillo. In Civitavecchia besides the phenomenon of the blood lachrymations, the family Gregori has received messages (some of which contain secrets that are only known to the bishop). 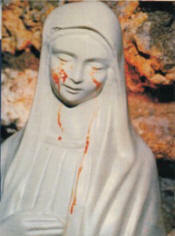 The messages have been given during some apparitions occurring from July 2nd 1995 to May 17th 1996. “Dear children, as a mother who knows her children, I know that you are crying out for my Son. I know that you are crying out for truth, for peace, for that which is pure and not deceptive. That is why I, as a mother, through the love of God, am addressing you and calling you that, by prayer and a pure and open heart within yourselves, you may come to know my Son - His love, His merciful heart. My Son saw beauty in all things. He seeks the good in all souls-even that which is little and hidden-so as to forgive evil. Therefore, my children, apostles of my love, I am calling you to adore Him, to ceaselessly give Him thanks, and to be worthy. Because He has spoken to you divine words, the words of God, the words which are for all and forever. Therefore, my children, live joy, radiance, unity and mutual love. This is what you need in today's world. In this way you will be apostles of my love. In this way you will witness my Son in the right way. Thank you.